After opening my review of SPQF talking about the slightly strange occurrences when two movies with very similar premises are released at the same time, I arrive, by complete happenstance, to this review of Master of Wills, a game that bears a lot of resemblances to Anthelion, the game I reviewed last week. Before Anthelion I had never played a tug of war style game so explicitly drawn, but now I’ve got my hands of two of them. Illuminati confirmed. I’m pleased that this coincidence happened, because it gives me the opportunity to compare two games that are trying to do very similar things when only one of them is successful at it. Where Anthelion is sleek and tense, Master of Wills is bloated and flabby. I don’t think it entirely fails, but it has the feel of a game that’s trying to do so much that it doesn’t do anything particularly well. The narrative behind the game is some kind of fight for power and control amongst various factions. It takes place in the “distant future” and looks like a kind of mishmash of noncommittal cyberpunk and a non-licensed superhero MMO. I mean, I suppose it gets the point across–there are shadowy figures and powerful faction leaders and corrupt governments–but I never got a sense of life or story from the game. In part that’s because the primary action in the game–pulling a card from the center area to your side of the board–is only concerned about raw numbers. Each time you take one of your 8 turns in a game of Master of Wills and select a card from the center, that’s going to trigger one or more other card moves based on what color they are. Predictably, the higher point value cards tend to push other cards away from you, while some low value cards can help steal something from across the table. Most of it’s in between. So you’ll pull some points over to your side, push some other cards, and go back and forth that way. Some cards will trigger more to be added to the center area, and once in a while you’ll be able to play a card from your deck. 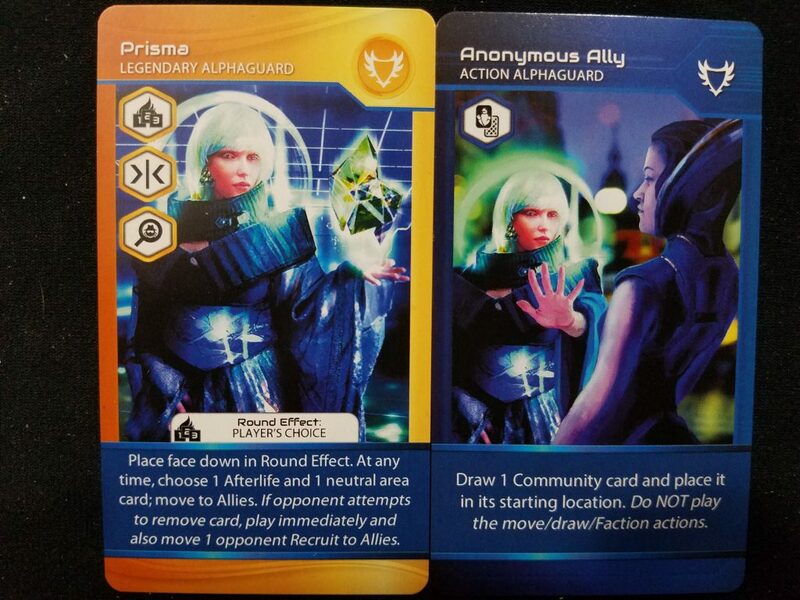 There are four different types of cards available to each side–legendary, epic, neutral, and action. 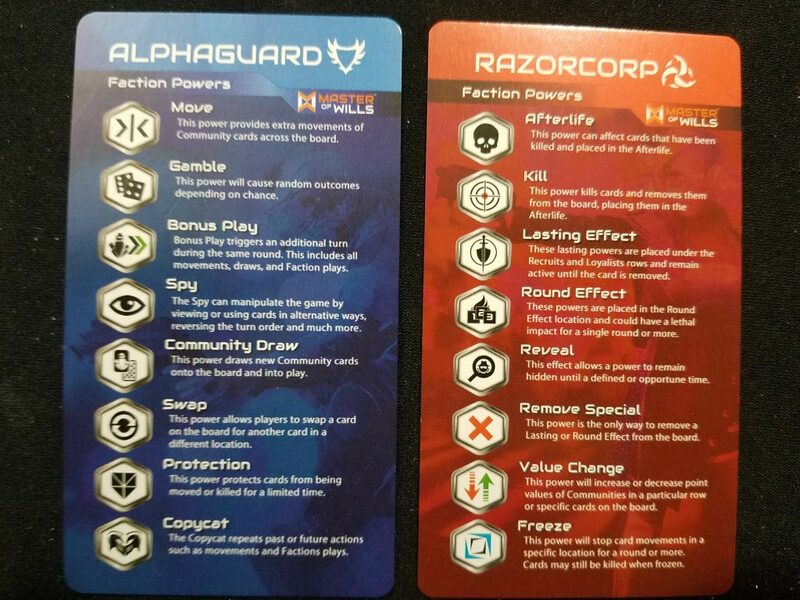 The only distinctions I can figure out between them are that legendary cards are clearly better than epic, and epic cards are clearly better than action cards. The neutral cards seem to be very similar (or perhaps identical) across factions, which doesn’t really do anything for the game, suggesting they perhaps ran out of unique ideas for card effects? Now, having some cards that are strictly better than others isn’t necessarily a bad thing in a deck construction game. Netrunner tried to keep the power curve relatively flat, favoring cards that are different but relatively equal in a vacuum. Of course that’s nigh-impossible to maintain and certain cards had to be banned and restricted to try to keep deckbuilding variety at the competitive level. Magic: The Gathering has power imbalance built into the business model, as rarer cards are typically more powerful than commons. This serves to drive sales and push an annoyingly expensive secondary market, but it does make limited formats, like drafting, interesting, as you have to build a deck with access to only a couple of rare cards, finding ways to either gain access to those better cards consistently, building around the protection of those “bombs”, utilizing synergies between the commons you draft, and everything in between. You also try to build around core concepts of maintaining card advantage and gaining favorable trades. To wit: if you can effectively eliminate the efficacy of a 6-mana giant creature with a 3-mana luminous bonds, which prevents that creature from attacking or defending, you’ve won that exchange. The potential for such interactions in Master of Wills is very limited. Cards rarely interact with the other player in any meaningful sense, instead changing the board state to varying degrees. I did once play a card that went facedown on the table, much like a trap card in Hearthstone, that would have triggered a better version of its ability if my opponent had played a card to kill it. They didn’t even have such a card in their deck, and thus the glimmer of hope I maintained for some kind of interactivity collapsed. The cards from your deck can only be played if you select a card from the center that has a particular icon on it. These icons are treasured, and reasonably the cards they are attached to aren’t quite as good as cards without them. Often times I’ll try to manipulate the card in such a way so that my opponent cannot possibly play a card from their deck next turn. Cards are added from the deck after each turn so that can never be guaranteed, but it’s still sad to consider that an effective strategy is to try to deny your opponent from doing something fun. But the biggest problem with the deck construction aspect of Master of Wills is that you barely even see your deck. Consider this: I spent a good 10 or 15 minutes my first game trying very hard to find some kind of strategy with the cards I selected for my 20 card deck. I ended up seeing 7 of those cards and playing 4 of them. 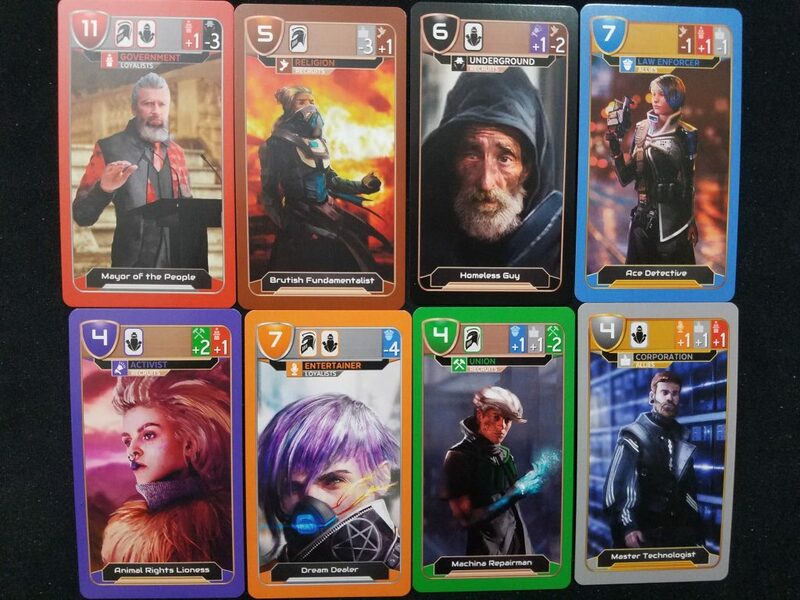 Even if I had cards that worked better in combination, the chances of actually drawing them and being able to play them near each other was almost nil, making the actual deck construction part of the game feel like an exercise in futility. I’ve since figured out the best strategy for deck construction: pick the best cards. “Of course that’s the best strategy, you moron”, you might be thinking, but hear me out. If the construction part of your game boils down to picking what are clearly the best cards, it has died. 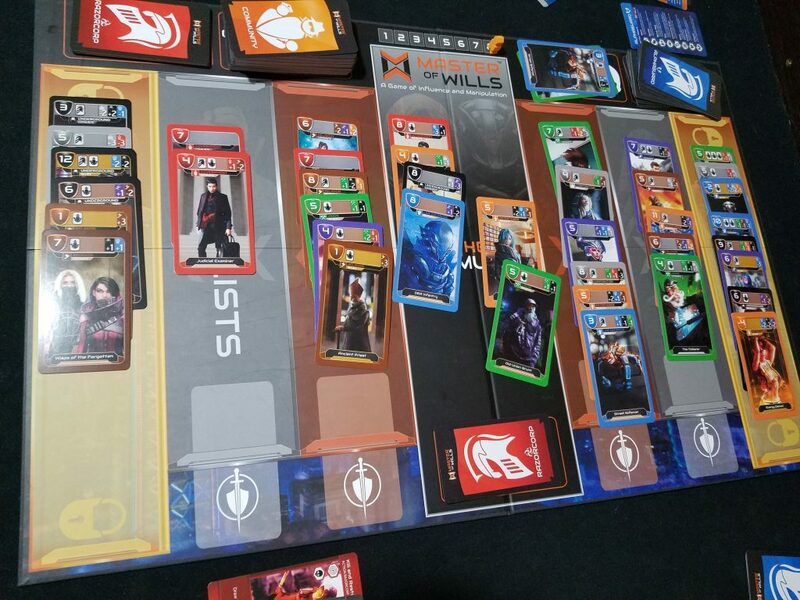 That can certainly be a baseline strategy to weigh other builds against–in Netrunner there was more or less always a viable strategy called “Shaper good stuff”, which is exactly what it sounds like, but there were ways to combat that. What was the downside? It was typically a bit slow, and it was predictable. Information is power, and as a corp if you saw Kate or Chaos Theory installing Magnum Opus, you knew exactly what to expect. None of this is relevant to Master of Wills. The first game I played I won because I drew both of my legendary cards and my opponent drew none of hers. My second game I had a choice in deck construction between a card that pulled three cards to my side of the table and another that pulled two cards. I chose the former, obviously. I don’t know why anyone would ever make a different decision. Granted there’s some potential for fun with the cards that are placed face down. There’s the barest, “what could they have put there?” level of interaction, but that’s not enough scaffolding to support player engagement. The most fun part of the game is with the tug of war cards, but that fun is predicated mostly on figuring out the puzzle in any given board state and not outwitting an opponent. You can think maybe one step ahead–”if I do this, my opponent will be able to do that, and that isn’t beneficial for me, so I’ll do this other move instead”–but because cards get cycled in so frequently the horizon for such planning is cut short. As a puzzle it’s actually decently engaging, but soon the novelty runs short as your eyes glaze over amongst the haze of numbers and colors you’ve got to work through. Here’s where the Anthelion comparison becomes educational. That game felt closer to a classic abstract where the person who was able to see into the future and predict the sequence of plays and counterplays tended to win. Master of Wills muddies that up too much with too many new cards and too much unknown. There are more cards on the table and more possible moves, but that doesn’t make the decision making better. Let me try to communicate this very subtle distinction: in Anthelion you spent time on your turn trying to find the best play; in Master of Wills you spend that time trying to find the correct play. During that time of silent consideration the line between playing and accounting grows thin. I’m not saying Master of Wills is a bad game, but an uninteresting one. Every aspect of the game works fine, but none of it works as well as the designers want it to. The deck construction boils down to far too much luck in what you draw, picking cards that are useful in a wide variety of contexts, and far, far too few opportunities to play those cards. The primary tug of war gameplay will make you evaluate a host of possibilities, but rarely will you find that your options are real decisions. Most of my playtime was spent counting which play netted me the most points. I then performed that move. The best games eliminate such certainty as much as possible. Here it’s abundant. Wow, you have successfully given the most uninformed review of Master of Wills I have ever seen. It’s quite incredible how far off the mark you are on both your understanding of the game and the strategic balance of it all. Why don’t you go download the app and try and beat me even 1 time out of 10 if you think the game is based on luck. You are so off it’s comical. There is a reason nobody reads your reviews. Nice job. I would love to take you up on that challenge! Figuring out how to run the app on my PC because, while slick, the app was WAY too small to play on my phone without eye strain, and I don’t have a tablet. Amy is absolutely correct in her evaluation. MoW challenges you both in strategic and tactical ways. Your review seems like it was based on a small number of plays, maybe even one and not any research.